Tonight is the first night of Rosh Hashanah, the Jewish New Year. For those of you who celebrate, Happy New Year! For everyone else (and even for some who celebrate), we thought we would take this opportunity to explain this holiday, and why it is held at this time of year. Though tomorrow is technically the first day of the seventh month in the Hebrew calendar, Rosh Hashanah is the new year of people, animals, and legal contracts. In Jewish tradition, this holiday marks the completion of the creation of the world. In celebration of the New Year, Jewish people from around the world gather in synagogues for extended services in which a shofar, or ram’s horn, is blown. This serves as a literal and spiritual wake-up call for all. A common greeting on Rosh Hashanah is shana tovah u’metukah, meaning “a good and sweet new year.” It is for this reason that traditional Rosh Hashanah foods are sweet, such as apples and honey, raisin challah and honey cake. 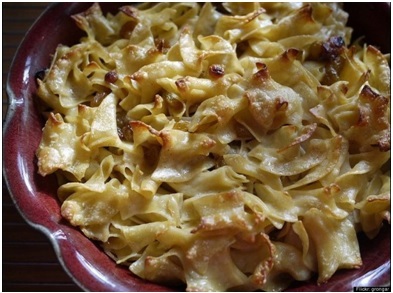 Another traditional food for this holiday is Noodle Kugel, and we’ve found a great recipe for you below, from EatingWell.com! 1. Put on your chef coat. 2. Preheat oven to 350° F. Coat a 9-by-13-inch glass baking dish with nonstick cooking spray. 3. Cook noodles in a large pot of boiling water until tender but firm, 5 to 7 minutes. Drain and refresh with cold water. Set aside. 4. Melt butter in a small skillet over low heat. Skim off froth and cook until it begins to turn light, nutty brown, 1 1/2 to 2 minutes. (Be careful not to burn the butter.) Pour into a small bowl and let cool. 5. Whisk together eggs, egg whites and cornstarch in a large bowl. Mix in cottage cheese, yogurt, milk, sugar, raisins, vanilla, salt and the browned butter. Stir in the cooked noodles and turn into the prepared baking dish. Stir together cornflakes, brown sugar and cinnamon in a small bowl. Sprinkle evenly over the noodle mixture. 6. Bake until browned and set, about 1 hour. (If topping starts to burn, cover with aluminum foil.) Let cool for at least 20 minutes. Cut into squares and serve warm or cold.